Beenie Man, once the undisputed king of the dancehall, confirmed his claim to that title by releasing an international hit single called King Of The Dancehall in 2004. But Beenie’s throne has been challenged twice this year - unintentionally by Sean Paul, whom Billboard referred to as “king of dancehall” in an online article from March, and most recently by Vybz Kartel, who released his massive hit album King Of The Dancehall in June. While Billboard’s claims can be disregarded as the opinions of tourists, Kartel’s album confirmed what dancehall’s core fans have been saying for years - Beenie’s reign is over. Long live King Kartel. It would be foolish to think that Beenie Man, with a lifelong career in Jamaican music, would willingly roll over and retire with the crowning of a new king of the dancehall. His new album, Unstoppable, speaks to his timeless vocal and lyrical talent as well as his resilience and perseverance. While the titular track, an electric guitar-heavy combination with Akon, is one of the weakest tunes from the project, tracks like the Major Lazer collaboration, I’m The King, showcase a still formidable artist with no intention of giving up his royal moniker. I’m The King is a mean mash up of trap, dancehall, and EDM, and it is arguably the Unstoppable song most likely to crossover into foreign audiences. The blending of dancehall with trap and EDM recurs on Unstoppable and these attempts to genre-bend out of Beenie Man’s core fanbase are generally done in a tasteful manner. In addition to the Major Lazer contribution, Play, produced by BlackOut Movements and SHS Records, is one of the strongest songs that attempts to merge musical influences. BlackOut, who started as a DJ from Long Island, has become a sought after producer in pop and hip hop, working with artists like Nicki Minaj, Flo-Rida, Pitbull, and UGK. For Play, BlackOut begins and later returns to a half-time 808-based trappy section complete with sub bass and hi-hat rolls, but the riddim quickly progresses into a more traditional dancehall pattern, resembling the clubbier bashment riddims of the late 90’s and early 2000’s. The following track, Stuck On You, has a similar vibe, but it also has a soca and R&B influence. Produced by Tony Kelly, Stuck On You features Verse Simmonds, a Virgin Island-born singer, songwriter, and producer who has worked with Kanye West, Rihanna, and Justin Bieber among others. Ironically, Verse sings the hook (and not a verse, as his name might suggest) for Stuck On You, but the combination is still one of the strongest on the album. While 808’s and sub bass may be welcoming signs for listeners unfamiliar with Beenie Man or dancehall in general, other sounds can break the ice as well. For instance, Having Fun, Unstoppable’s opening track, has a carefree, poppy vibe fueled by the interplay between guitar, bells, and what appears to be a reversed synth sample. The legendary Tony Kelly, kills it again with this one, creating a fresh and fun vibe with minimal instrumentation and an eclectic drum kit. Beenie’s delivery on Having Fun is in top form, and his lyrics remind the listener that they should take having fun more seriously. 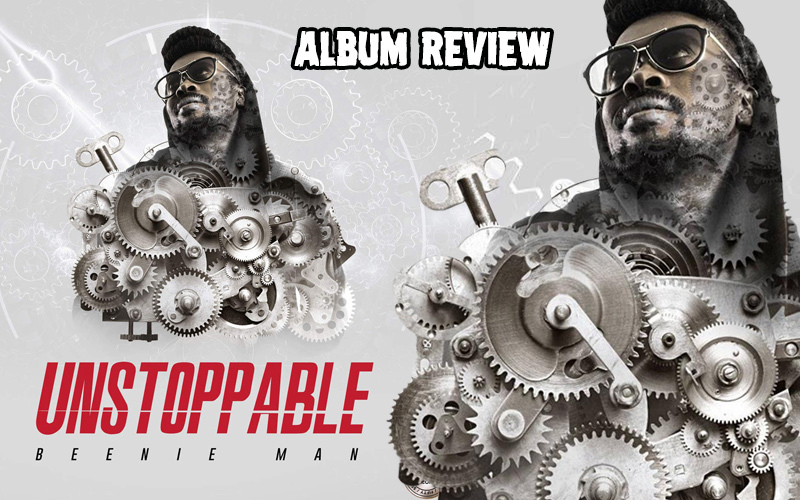 To aid them in this quest for more fun, Unstoppable also has a remix of Beenie Man’s contribution to the 2015 Chimney Records juggling, After Party Riddim. The tune, We Run Road, has a complete makeover for the album, with a brand new mix, customized drum patterns, and a guest appearance from up-and-coming hip hop artist, J Gunn. Gunn, who’s voice is notably similar to Jay Z’s, sounds surprisingly comfortable on the dancehall riddim, expertly mimicking After Party’s signature arpeggiated synth loop with his flow. With the emcee’s stock quickly rising in the hip hop world, We Run Road Remix has the potential to create a buzz outside of Jamaica. Although much of the album is aimed at outside markets, there are a few tunes that speak to more authentic Jamaican tastes. Yardie was released as a single in August as a precursor to the album, and the reception in Jamaica has been good so far. Time will tell how much respect the tune will ultimately get in the dance, but the song has a certain hard-hitting vibe and a peculiar choppy bounce that, when paired together, are more likely to excite Jamaican ears than foreign. Similarly, Call The Crew, which features Sizzla and Agent Sasco, is one of the few one drop riddims on the album and it has a cool, foundation reggae vibe that is likely to please longtime fans. The riddim resembles the classic Studio One shot, Hot Milk, with a similar bassline, rhythm guitar, and melody, but it has been altered enough that it could be difficult, even for a seasoned fan of Jamaican music, to pick up on the similarities between the two riddims.